Seismicity at Talang had generally declined since February 2009. However on 16 August 2009 there was a M 6.9 earthquake centered W of Sumatra in the southern part of Siberut Island. That event caused tremors recorded at Talang. Increased seismicity through the next day led to CVGHM to raise the Alert Level for Talang from 2 to 3 (on a scale of 1-4). Monitoring was also stepped up, and an emergency response team was assigned to conduct an onsite evaluation. Foggy conditions prevented visual observations. Between the August activity and February 2010, Talang was comparatively quiet; however in early February another episode of increased seismicity included harmonic tremor, shallow volcanic earthquakes, and deep volcanic earthquakes. By 17 February the elevated seismicity had subsided. MODVOLC satellite surveillance has shown no indications of any thermal activity. On 17 February, CVGHM lowered the Alert Level for Talang from 3 to 2 (on a scale of 1-4) because seismicity had declined in general since February 2009. Visitors and tourists were advised not approach the crater. On 17 August, CVGHM raised the Alert Level for Talang from 2 to 3 (on a scale of 1-4) because of increased seismicity during the previous two days. Foggy conditions prevented visual observations. Visitors and tourists were advised not to go within a 3-km radius of the summit. CVGHM lowered the Alert Level at Talang to 2 (on a scale of 1-4) on 14 December based on visual observations and a decrease in the number of earthquakes. During 7-10 December, observations of the summit were limited by inclement weather. On 11 December, "smoke" rose to a maximum altitude of 3.3 km (10,800 ft) a.s.l. from the Main crater. Plumes were also observed from South crater and Gabuo Atas solfatara field. Visitors were advised not to go within a 2-km radius of the summit. Based on visual observations, CVGHM reported that during 18-25 June thick brown ash plumes from Talang's Main Crater rose to an altitude of 3.1 km (10,200 ft) a.s.l. Diffuse white ash plumes rose to an altitude of about 3 km (10,000 ft) a.s.l. from the South Crater. The Alert Level remained at 2 (on a scale of 1-4). Based on information from CVGHM, the Darwin VAAC reported that on 19 and 20 March ash plumes from Talang rose 3.4-3.9 km (11,000-12,800 ft) a.s.l. CVGHM raised the Alert Level to 3 (on a scale of 1-4). CVGHM lowered the Alert Level at Talang to 2 (on a scale of 1-4) on 27 January due to a reduction in seismic activity since 23 November 2006 to 24 January 2007. Gas plumes were present from the South Crater and the Main Crater. CVGHM raised the Alert Level at Talang to 3 (on a scale of 1-4) on 9 September due to an increase in tremor. On 10 September, a brownish plume rose 250 m above the summit (~10,000 ft a.s.l.). DVGHM increased the Alert Level at Talang from 2 to 3 on 18 July due to an increase in seismicity at the volcano. During 15-18 July, the seismic network recorded 93 deep volcanic earthquakes, one low-frequency tremor, and three "felt shocks" around the N slope of the crater. Minor phreatic activity occurred at the southern and northern slope craters, with ash plumes rising 0.5-1.5 km above the crater (11,100-14,400 ft a.s.l.). Due to a decrease in seismicity at Talang during 24-28 April, DVGHM reduced the Alert Level from 3 to 2 (on a scale of 1-4) on 28 April. Visitors were still not permitted to enter within a 1 km radius of the crater. According to DVGHM, the eruption that began at Talang on 12 April ended on 14 April. During 14-17 April, the intensity of the activity at the volcano decreased so DVGHM reduced the Alert Level from 4, the highest level, to 3. People were permitted to return their homes near the volcano, but no one could enter within 1 km of the summit. During 24-30 September volcanic activity increased at Talang volcano. Observers noted that on 25 September during 1722-1838 a thick white-brownish plume with high gas pressure rose 200-350 m above the volcano. Personnel at the observatory could smell sulfur during the evening. In comparison to measurements in 2000, temperatures increased in 2001 at Batu Bajanjang hot spring (from 40-60°C to 45-66°C), Gabuo Atas fumarole field (from 98-99°C to 111-114°C), and Gabuo Bawah fumarole field (from 96-99°C to 100-101°C). In addition, the water level at Batu Bajanjang hot spring decreased drastically. Talang was at Alert Level 2 (on a scale of 1-4). Signs of enhanced activity at Gabuo Atas solfatara field were observed in May, when increased fuming was noted. The area of thermal activity has grown to cover ~10 hectares, but the temperatures of solfataras have remained in the normal range, between 92 and 97°C. Increased thermal activity in the Gabuo Atas solfatara field continued through July, when dark-colored fume was noted. The temperatures of the solfataras have remained in their normal range, 92-97°C. Information Contacts: W. Modjo and Tulus, VSI (as reported in BVE, no. 26, March 1989). The last reported activity at Talang occurred in October 1986 (minor steam explosions). 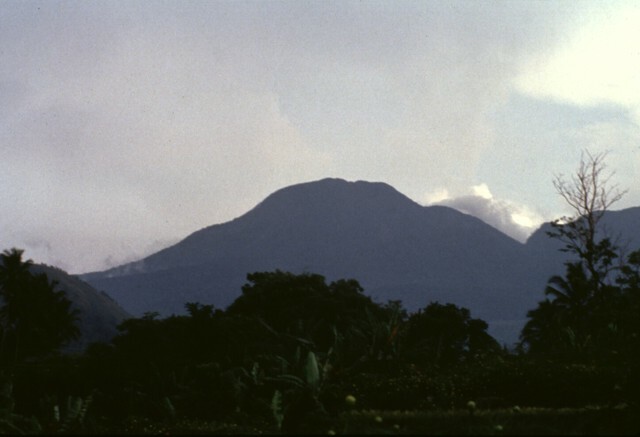 Talang was relatively quiet after that, until September 2001, when the Volcanological Survey of Indonesia (VSI) reported an increase in activity. On 25 September 2001 the volcano ejected a "white thick-brownish" plume that rose 200-350 m. That evening, a sulfur smell was noticed at the post observatory. Temperatures at Batu Bajanjang hot spring and the fumarole fields at Gabuo Atas and Gabuo Bawah increased (table 1). The water level at Batu Bajanjang decreased drastically. Table 1. Comparison of temperatures of various locations at Talang during 2000 and 2001. Courtesy of VSI. Because of a broken seismograph, seismicity at Talang could not be observed until 3 October. During 1-7 October, Talang was dominated by tectonic earthquakes. A thin-white plume reached 50-100 m above the summit. VSI reported four deep volcanic (A-type) events, two shallow volcanic (B-type) events, and 18 tectonic earthquakes. Talang volcano is at Alert Level 2 (on a scale of 1-4). During 11 March-16 June 2002 at Talang, seismicity was dominated by small explosion earthquakes (table 4). A thin white plume reached 50-100 m above the summit and sometimes drifted E. Hotspring temperatures were 42-64°C. As of 13 May, the Volcanological Survey of Indonesia (VSI) reported that no seismic data were available because of a broken seismograph. During April and early May seismicity had been decreasing. Talang remained at Alert Level 2 (on a scale of 1-4) throughout the report period. Table 4. Earthquakes at Talang during 11 March-12 May 2002. The seismograph was broken as of 13 May, so no seismicity data was available through at least 16 June. Courtesy VSI. During 17 June-28 July 2002 at Talang a generally white, thin plume rose 25-100 m above the crater and drifted E. [Throughout July the activity was described as a "white-thin ash plume."] Hot spring temperatures ranged from 43 to 64°C. No seismic data were available because of a broken seismograph. Talang remained at Alert Level 2. Indonesian volcanologists with the Center of Volcanology and Geological Hazard Mitigation (CVGHM) (previously known by other names, including the Volcanological Survey of Indonesia) maintain an observation post and seismic network at Talang. After intermittent activity during September 2001 (BGVN 26:10) until June 2002 (BGVN 27:06), there was no additional reported activity until 2005 and 2006. Activity during April 2005. On 12 April 2005 an eruption at Talang during 0340-0600 produced an ash plume that rose to ~ 1 km above the crater. About 4 mm of ash fell in the village of Bukit Sileh, NE of the crater. On the afternoon of 10 April observers had noted a "grey ash cloud" rising ~ 100 m, followed the next day by a diffuse white cloud around the summit. Volcanologist Dalipa, who heads the Batu Bajanjang observation post, told The Jakarta Post that there had been five large eruptions and hundreds of small eruptions before 1200 on 12 April that caused ashfall as far as 10 km away. He added that between the evening of 12 April and 0600 the next morning there were only six small eruptions. An infrared image (GOES-9) taken at 0425 on 12 April 2005, analyzed by the Darwin VAAC, showed the eruption plume. There was a weak ash signature in the small cloud for a couple of hours before it became difficult to track. Plume height was estimated to be 7.5 km because the upper part of the cloud went NW, and winds below that were more or less westerly. The height of the cloud would have been difficult to see from the ground during the peak activity before dawn. Simon Carn reported that the Ozone Monitoring Instrument (OMI) on EOS/Aura detected an SO2 plume from Talang on 12 April at 1402, and possible much weaker emissions on 13 April. The plume on 12 April extended roughly ESE towards central Sumatra, so was presumably at a lower elevation than the upper part of the ash cloud imaged earlier by the Darwin VAAC. The preliminary estimated SO2 mass was around 1,000 metric tons. Weak emissions were reported several days prior to the 12 April event, but OMI data only showed SO2 emissions from nearby Kerinci volcano. A local government official told news media on 14 April that 25,150 residents from five villages in Lembang Jaya and Gunung Talang districts, located within a 5-km radius from the danger zone, had been evacuated. Winds were reportedly carrying ash downslope along with volcanic gases. On 13 April volcanic and seismic activity decreased in comparison to the previous day. A "white-gray ash plume" rose 250 m from three points inside Kawah Mati crater, and white gas was emitted from Gabuo Atas crater. There was a decrease in the number of deep volcanic, shallow volcanic, and explosion earthquakes. By 0600 on 14 April the only reported activity was a diffuse "white ash" plume rising 250-300 m above the crater. However, news media quoting a government geologist reported that Talang "sent out fresh clouds of dust and continued to rumble" on 15 April. By 17 April, activity had decreased and volcanologists lowered the hazard status to 3 (on a scale of 1-4). People were permitted to return their homes near the volcano, but no one could enter within 1 km of the summit. Due to a continued decrease in seismicity during 24-28 April (less than 10 volcanic events per day), the Alert Level was dropped to 2 on 28 April. Due to the hazards of minor phreatic eruptions, unstable land, and toxic gases, the area within a 1-km radius of the crater remained closed. Activity during July 2005. Small phreatic eruptions occurred on 2 and 3 July 2005. The eruptions occurred at the main crater and a crater on the S slope. Ash columns reached 300-500 m above the volcano and caused 0.5-1 mm of ashfall around Kampung Batu, 2 km S of the summit. On the N slope, the Gabuo Atas, Gabuo Bawah, and Kapundan Panjang craters emitted "white-brown steam" to low altitudes. The temperature of Batu Bajanjang hotspring, located below the summit, was 41.9-61.3°C. The hazard status remained unchanged at Alert level 2 (on a scale of 1-4). Increased seismicity on 18 July prompted an change in the Alert Level to 3. During 15-18 July, the seismic network recorded 93 deep volcanic earthquakes, one low-frequency tremor, and three "felt shocks" around the N slope of the crater. Minor phreatic activity occurred at the S and N slope craters, with dark gray ash plumes rising 0.5-1.5 km above the crater on 18 July. Activity during September 2006. Increasing seismicity and gas emissions led to the hazard status being raised to Alert Level 3 on 9 September 2006. The next day "brownish smoke" was being emitted to heights of 250 m. The daily number of volcanic earthquakes and tremor fluctuated over the next few months, reaching a high of 33 events on 23 November. After that date seismicity showed a decreasing trend through late January 2007. Weak gas emissions continued during this period from both South Crater and Main Crater. Due to the lowered levels of activity, the hazards status was once again dropped to Alert Level 2 on 27 January. Information Contacts: Center of Volcanology and Geological Hazard Mitigation, Diponegoro 57, Bandung, Jawa Barat 40122, Indonesia (URL: http://vsi.esdm.go.id/); Andrew Tupper, Darwin Volcanic Ash Advisory Centre, Bureau of Meteorology, Australia (URL: http://www.bom.gov.au/info/vaac/); Simon Carn, Joint Center for Earth Systems Technology (JCET), University of Maryland Baltimore County (UMBC), 1000 Hilltop Circle, Baltimore, MD 21250, USA; Agence France-Presse (AFP) (URL: http://www.afp.com/english/home/); Indahnesia.com (URL: http://news.indahnesia.com/); The Jakarta Post, Indonesia (URL: http://www.thejakartapost.com/); Associated Press (URL: http://www.ap.org/). The Center of Volcanology and Geological Hazard Mitigation (CVGHM) lowered the Alert Level of Talang to 2 (on a scale of 1-4) on 27 January 2007 due to a reduced seismicity between 23 November 2006 and 24 January 2007, although gas plumes originated from South and Main craters. There had been eruptive episodes in April 2005 and elevated activity during late 2006 (BGVN 32:01). On 17 March 2007, CVGHM raised the Alert Level based on increased "smoke" and tremors to 3 (on a scale of 1-4). The Darwin Volcanic Ash Advisory Centre (VAAC) reported that, based on information from CVGHM, ash plumes rose to altitudes of 3.4-3.9 km on 19-20 March. Local authorities and residents were advised to prepare for a possible evacuation. On 23 April 2007 the Alert Level was reduced to 2. During 18-25 June, thick brown ash plumes rose from Main crater to an altitude of 3.1 km. Diffuse "white ash" plumes rose from South crater to an altitude of 3 km. On 29 November CVGHM raised the Alert Level to 3 (on a scale of 1-4) based on visual observations and seismicity. During 27-29 November, ash and steam plumes from multiple craters rose to altitudes of 3.1-4.1 km. A strong smell of sulfur dioxide gas was reported. Visitors were advised not to go within 3 km of the summit. During 7-10 December, observations were limited by inclement weather. On 11 December, "smoke" rose from the Main crater to a maximum altitude of 3.3 km. Plumes were also observed from the South crater and Gabuo Atas solfatara field. On 14 December visual observations and a decrease in the number of earthquakes prompted a lowering of the Alert Level back to 2. Information Contacts: Darwin Volcanic Ash Advisory Centre, Bureau of Meteorology, Commonwealth of Australia (URL: http://www.bom.gov.au/info/vaac); Center of Volcanology and Geological Hazard Mitigation (CVGHM), Jalan Diponegoro 57, Bandung 40122, Indonesia (URL: http://www.vsi.esdm.go.id/). Talang had an increase in seismicity during mid-2009. Minor tremor and emissions of ash and sulfur dioxide (SO2) occurred during 2007 (BGVN 33:02). The Alert Level was lowered to 2 (on a scale of 1-4) on 14 December 2007 based on visual observations and a decrease in earthquakes. In their report of 17 August the Center of Volcanology and Geological Hazard Mitigation (CVGHM) reported seismic activity between 1430 on 16 August through 0600 on 17 August. On 15 August there were four deep volcanic events and one low-frequency earthquake. Over the next two days they recorded 917 deep volcanic and another 30 shallow volcanic earthquakes, along with continuous tremor. Because of the significant increase in seismic activity, CVGHM increased the Alert Level from 2 to 3. It also stepped up its monitoring and assigned an emergency response team to conduct an onsite evaluation. Foggy conditions prevented visual observations. Visitors and tourists were advised not to go within 3-km of the summit. Talang, which forms a twin volcano with the extinct Pasar Arbaa volcano, lies ESE of the major city of Padang and rises NW of Dibawah Lake. Talang has two crater lakes on its flanks; the largest of these is 1 x 2 km wide Danau Talang. The summit exhibits fumarolic activity, but which lacks a crater. Historical eruptions have mostly involved small-to-moderate explosive activity first documented in the 19th century that originated from a series of small craters in a valley on the upper NE flank. There is no Deformation History data available for Talang. Talang volcano, seen here from the Volcanological Survey of Indonesia observation post at Batu Barjangan on the NNE side, is a twin volcano with the older Pasar Arbaa volcano. The summit of Talang lacks a crater, and historical eruptions, consisting of mild explosive activity, have originated from a valley on the NE flank. 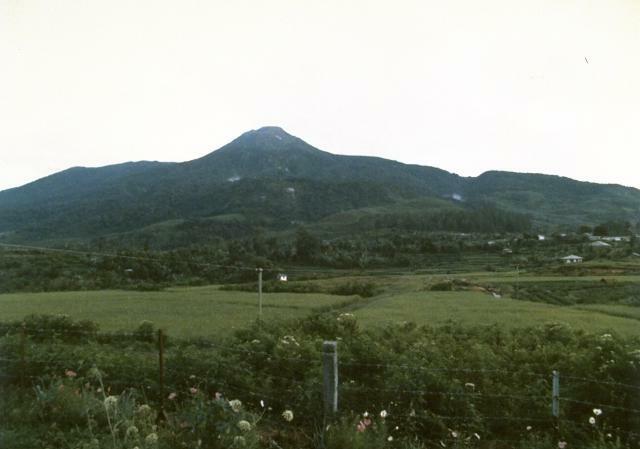 The summit of forested Gunung Talang volcano, seen here from the NW, lacks a crater, although two crater lakes occur on the flanks of the volcano. Several flank eruptions took place during the 19th century. There are no samples for Talang in the Smithsonian's NMNH Department of Mineral Sciences Rock and Ore collection. IRIS seismic stations/networks Incorporated Research Institutions for Seismology (IRIS) Data Services map showing the location of seismic stations from all available networks (permanent or temporary) within a radius of 0.18° (about 20 km at mid-latitudes) from the given location of Talang. Users can customize a variety of filters and options in the left panel. Note that if there are no stations are known the map will default to show the entire world with a "No data matched request" error notice. Large Eruptions of Talang Information about large Quaternary eruptions (VEI >= 4) is cataloged in the Large Magnitude Explosive Volcanic Eruptions (LaMEVE) database of the Volcano Global Risk Identification and Analysis Project (VOGRIPA).